Talk about bad timing: In April, Plair released a HDMI streaming adapter that promised to bring an Airplay-like experience to any TV set. The device had a bit of a rocky launch, thanks to a high $99 price and buggy software. And then, just three months later, Google (S GOOG) released Chromecast. The same idea, but a better execution, while costing just $35. Plair’s product was doomed. But the team behind it didn’t give up, and instead refined the experience to launch a second version this month: Plair 2 still does Chromecast-like video beaming, but also brings Android apps to the TV screen, including services like Netflix (s NFLX) and Hulu Plus that weren’t available on the original Plair. I got a first demo of the new Plair stick recently and was relieved that it doesn’t just bring the default Android mobile UI to the TV screen, which is what a flood of cheap Android TV adapters have been offering up until now. Instead, it presents some featured apps in a kind of coverflow-like experience, making it easy to access your favorites. 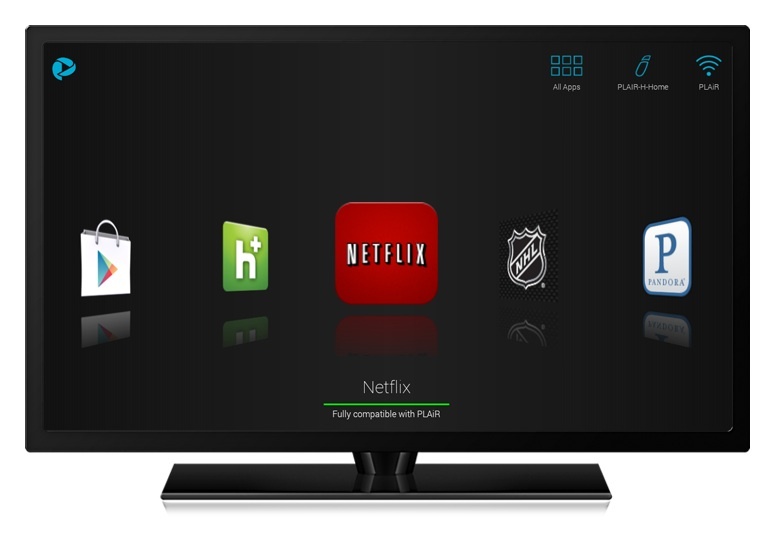 However, I was a bit concerned when I heard that Plair is relying on the mobile apps for Netflix and Hulu Plus and other online video services. Sure, many of these services now stream in HD on mobile as well, thanks largely to better-and-better phone and tablet displays. But what works well on a tablet doesn’t necessarily translate to a good user experience on the TV screen. I’ve since gotten a review unit of Plair 2 and will report back once I have gotten some hands-on experience with the product. In the end, the question for Plair may be how well it can position itself between upcoming Android TV products from major manufacturers and Chromecast. There is clearly a lot of interest in Chromecast right now, and once more apps come to the platform, there may be little reason for the average consumer to instead opt for a product like Plair. However, Google is also getting ready to reposition Google TV, going as far as completely dropping the Google TV brand and instead calling products Android TV. One shouldn’t be too surprised to see consumer electronics manufacturers come out with their own takes on Android TV in 2014, some of which may include a more minimal, Plair-like app experience and a pure focus on streaming. If Plair gets this right before the big guys are ready, then it might actually have a shot to at least fine a niche.